Diplodia, also referred to as Sphaeropsis Tip Blight is a disease caused by the Diplodia Pinea fungus. 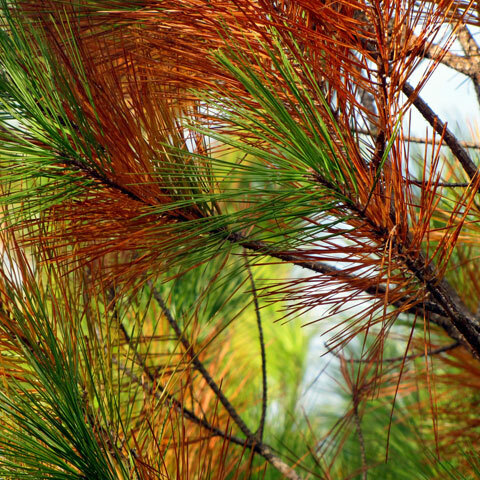 This disease affects coniferous pine trees, and more specifically Pines where needles are in bunches of 2's and 3's. This disease primarily attacks mature trees (25 years+), with the exception of very young seedlings. Diplodia will very rarely infect a tree that 15 years of age or younger. Diplodia is not often found in forested areas. It is most commonly found in urban areas, and where the trees are being used for ornamental purposes. These unnatural conditions can cause stress on the Conifer tree, which is the perfect situation for Diplodia to attack and flourish. Diplodia is caused when the Pinea fungus is introduced to a mature pine tree that is under a lot of stress. This fungal infection first attacks the new shoots growing on the plant and then moves outwards affecting the needles. Spores from the Pinea are left behind. The black fungal bodies (Pycnidia) start to appear at the base of the needles. These fungal bodies can also be found on the pine shoot (new stems). These spore-producing fungi are easily be confused with damage caused by moth larvae. To easily distinguish if the stem shows signs of Diplodia or moth damage you should examine the shoot for larvae tunnels. Wet weather is Diplodia Tip Blight's favourite condition for an attack. Diplodia is most actively produced in early spring and fall but becomes most active and evident during late spring and early summer. At this time of year, the new shoots are growing and elongating and become very vulnerable to the fungal bodies at this time.